Freed Americans Arrive In Oman : The Two-Way Shane Bauer and Josh Fattal have been held since July 2009. Along with a third American, who was released last year, they were convicted of spying. The three say they were hiking along the Iraq-Iran border and got lost. 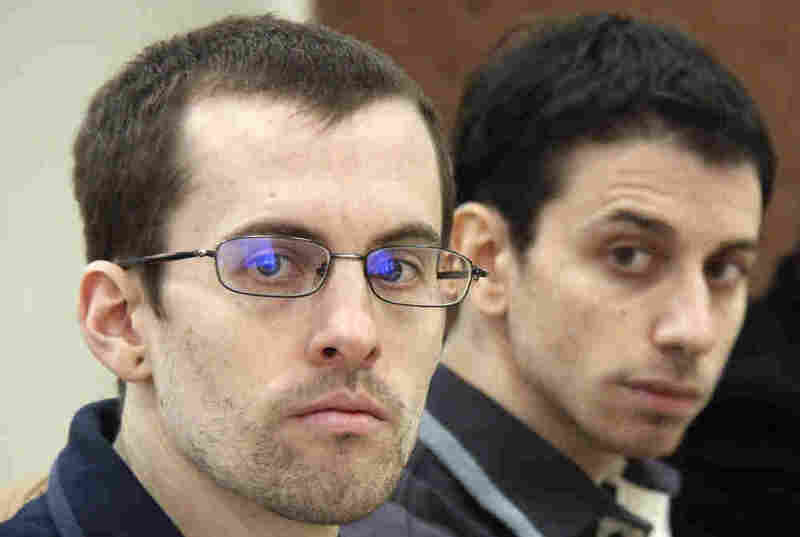 A photo released by Iran's state-run Press TV on Feb. 6, 2011, shows U.S. hikers Shane Bauer (left) and Josh Fattal at court in Tehran. Two American men jailed as spies in Iran since 2009 have been released, Iran's official Press TV reports. The news site says it "has learned" that news. Its report follows word from The Associated Press that attorney Masoud Shafiei said a court has approved a $1 million bail-for-freedom deal for the release of Shane Bauer and Josh Fattal. As we reported last week, Iranian President Mahmoud Ahmadinejad told NBC News that Shane Bauer and Josh Fattal would be released "in two days." Then the country's Judiciary "rejected recent media reports on the imminent release of the two American nationals that were convicted of spying on behalf of the United States." And a judge who needed to sign off on the deal couldn't be reached because he was on vacation. Now, apparently, the final details have been worked out. Bauer, Fattal and a third American, Sarah Shourd, were arrested in July 2009 when they crossed from Iraq into Iran. They were hiking and say they got lost. Iran accused and convicted them of spying. Shourd was released last year after payment of a $500,000 "bail." Then all three were convicted of spying (Shourd did not return to Iran for the trial). Update at 6:14 p.m. ET. NPR's Scott Neuman has a piece that explores the role that Oman played in the release of the Americans. I welcome the release of Shane Bauer and Josh Fattal from detention in Iran and am very pleased that they are being reunited with their loved ones. The tireless advocacy of their families over these two years has won my admiration, and is now coming to an end with Josh and Shane back in their arms. All Americans join their families and friends in celebrating their long-awaited return home. We are deeply grateful to His Majesty Sultan Qaboos bin Said of Oman, Iraqi President Jalal Talabani, the Swiss government, and to all our partners and allies around the world who have worked steadfastly over the past two years to secure the release of Shane and Josh. Update at 3:58 p.m. ET. Reuters reports that one of their reporters saw the two men leave the plane and enter the terminal building. We'll update again, when we get word of any reaction from the hikers. Update at 3:35 p.m. ET. CNN is reporting the hikers have landed in Oman. Earlier, the network reported, that Fattal had spoken with his brother by phone after his release. A family spokeswoman told CNN that family members would head to the Oman airport to greet Bauer and Fattal. Update at 2:10 p.m. ET. The AP now reports that Bauer and Fattal are on a plane en route to Oman. Update at 12:20 p.m. ET: The BBC reports that "the two men, both 29, left the prison compound just minutes after their Iranian attorney, Masoud Shafiei, said he had finished the paperwork for their release, obtaining the signatures of two judges on a bail-for-freedom deal. He told AFP news agency the bail funds had been provided by the state of Oman, a U.S. Gulf ally which has good relations with Iran." Update at 10:10 a.m. ET: The Associated Press says its reporters just "saw a convoy of vehicles with Swiss and Omani diplomats leaving Evin prison Wednesday with the freed Americans inside." Update at 9:15 a.m. ET: Reuters says a lawyer for the men now says their release is "minutes or hours" away, which may mean that paperwork and final interviews with Iranian authorities are still in the works. Update at 7:25 a.m. ET: Press TV now adds that "Branch 36 of Tehran's Appeals Court has agreed to reduce the detention sentences of the two US nationals and instead release them on a bail of $500,000 each, a statement released by Iran's Judiciary said on Wednesday." They had been sentenced to eight years each in prison.